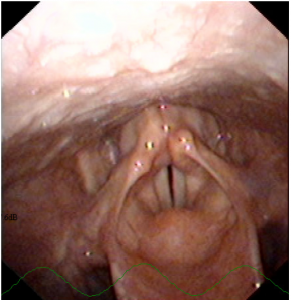 Notice the visible gap between the vocal folds, which is bigger at the back. 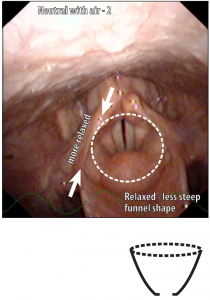 You can see that the back wall of the larynx is relaxed leaving the larynx open so you can see the vocal folds easily. You can also see the aryepiglottic fold is stretcheded and relaxed and the opening of the larynx (the laryngeal inlet) has a shape of an ‘open’ funnel which is rather wide at the top.